This is the story of Tom Kelman, a qualified equine Bowen therapist who now resides just north of Gympie, Queensland. He was born 80 years ago, on a station near Richmond (QLD), where he was quickly put on a pony and sent out mustering with his parents, long before school age. Tom became a master of all things equine; breaking in, mustering, etc on the station. He was also pretty sharp in the camp draft arena, where his wife Fe tells that he held a thirty year record for the highest cut-out score at the Richmond rodeo. Later, after moving to Victoria, he had a bit of a play in the show jumping scene at the local shows. During this time, he was lucky enough to train with Art Uytendaal, the man who introduced the dressage training scale to show jumping here in Australia, from the Netherlands. This put him in good stead for the switch to dressage he would make much later. During this time, Tom discovered his interest in Bowen Therapy. He has spent over 20 years since his accreditation, studying and further developing his own techniques. In his late fifties, Tom turned to dressage. Somewhere around the age of seventy, when the rest of us would usually be thinking of hanging up our spurs, Tom started his journey toward Advanced dressage on ‘Beameye Bell’, trained by Lynne Keys. Again, he managed to use his good judgment in choosing a trainer, by heading Vince Corvi's way. After Bell was retired, was it time to give up? You must be joking. Seventy seven was obviously far too young to retire. So, Tom moved on to a beautiful warmblood called ‘Wally’. It then unfortunately came time to find a new trainer, due to the untimely passing of Vince. This time, Tom chose a horse as his trainer. 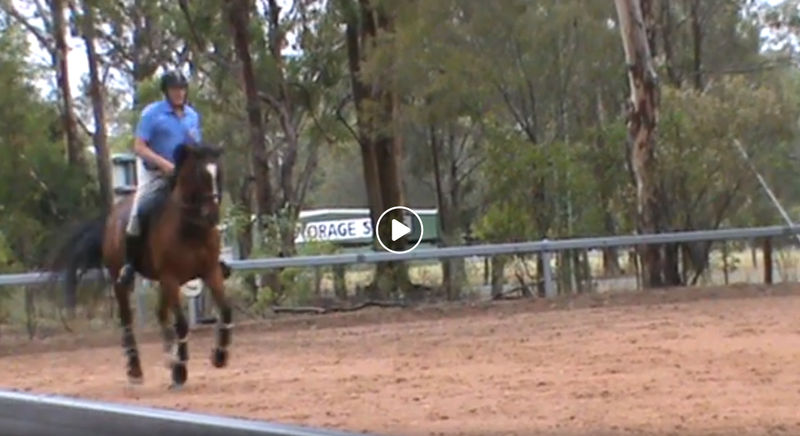 He headed to Carousel Competition Training in Nanango, the home of many wonderful school masters and mistresses, including the highly successful ‘Carousel Appley Dappley’ – who is still competing and giving lessons at the grand old age of thirty. Here Tom set about riding the inimitable ‘Fletcher Jones’, a horse who has carried many young and ... well, let’s say... more ‘mature’ riders right up through the ranks. At the end of the first lesson, Tom decided he and Fletcher were ready to try some flying changes …every second stride. Why not? No time like the present, when you are eighty!